PLEASE NOTE Donner Pass: Southern Pacific is a large download (1.2GB) and may take time to download from Steam. If your internet connection has download size or monthly data restrictions, please check with your internet service provider before purchasing. Rail Simulator 2: RailWorks 2. RailSimulator.com Limited, Compton House, Walnut Tree Close, Guildford GU1 4TX. 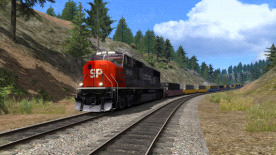 ©2009 RailSimulator.com Limited. All rights reserved. Portions originally developed by Kuju Entertainment Limited in association with F4G Software plc. Portions copyright Kuju Entertainment Limited 2007. Physics engine provided by Ageia Technologies Inc. The Rail Simulator Logo is a registered trademark. The RailWorks 2 logo is a trademark of RailSimulator.com Limited. DB and the DB logo are trademarks of Deutsche Bahn AG. First and the First Logo are trademarks of the First Group plc. The Creative logo is a trademark of Creative Labs Inc. The Union Pacific shield is a trademark of the Union Pacific Railroad Company. All other trademarks are the property of their respective owners.